No time to cook? 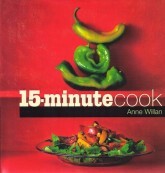 Take a cue from Anne Willan’s The 15 Minute Cook (Whitecap paperback, 2004) originally published as In and Out of The Kitchen in Fifteen Minutes or Less (Rizzoli, USA and Quadrille, UK, 1995) with its 100 quick and easy recipes. Available in six foreign language editions.